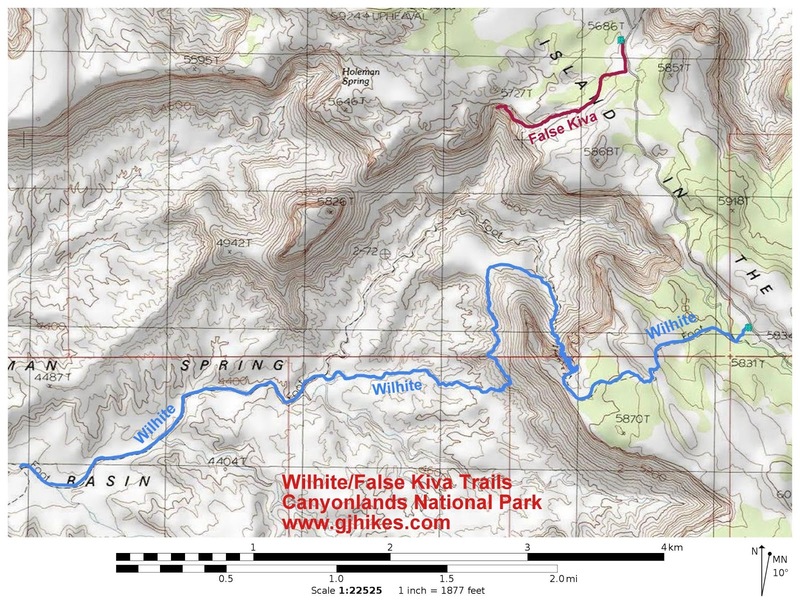 The Wilhite trail is located in the Island in the Sky District of Canyonlands National Park near Moab, Utah. The trail descends down a talus filled chute from the Island in the Sky to the White Rim Road over 1600 feet below and just over 6 miles away. Spectacular red rock scenery with towering canyon walls including distant views of False Kiva, Cleopatra's Throne and Candlestick Tower are among the things that attract thousands of visitors to Canyonlands National Park every year. To get to the trailhead from the Island in the Sky Visitor Center follow the Grand View Point Road for 6.3 miles and turn right on the Upheaval Dome Road. The Wilhite trailhead will be on the left after another 2.1 miles. From the trailhead the route leads over to a wash which it follows for a short distance. Near a small spillover the trail climbs out of the wash on the left side and begins climbing to the top of the hill. From the top of the hill the views to the west open up with Candlestick Tower being one of the more prominent features. The trail descends gradually from the ridge and works its way around to where it drops off of the Island in the Sky into Holeman Basin. This point of the Wilhite trail is 1.44 miles from the trailhead and the elevation is 5,700 feet. Over the next mile the trail will lose 900 feet of elevation getting to the wash below. As the Wilhite trail starts down the chute it follows several switchbacks that take advantage of the ledges near the rim. From there the trail makes use of the massive pile of rubble that cascades down the chute to the basin. As the trail descends the chute the canyon walls create a delightful scene as they begin towering higher and higher until the hiker is all but dwarfed in comparison. At the bottom of the chute the trail turns west towards the mouth of the basin. For the next mile the trail traverses around the base of the cliffs along a bench. Looking out over Holeman Basin toward the White Rim the rest of the route comes into view. The trail descends a short hogback that takes it off the bench to the area below. From there the trail works its way over to a shallow wash that is a finger of the main wash that leads out to the White Rim Road. The wash makes up the last 2 miles of the trail. The width and depth of the wash varies as the walls transition from short mudstone cliffs to sandy slopes. Care should be taken whenever thunderstorms are in the area. The highwater mark from flashfloods that rage through the confines of the wash range between 3 to 6 feet deep depending on how wide the wash is at that point. 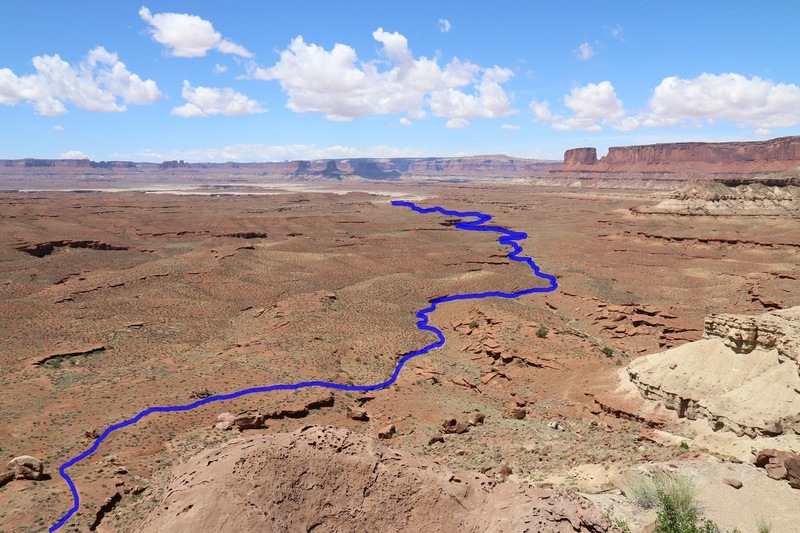 The trail comes to an end at the point where the White Rim Road crosses the mouth of the wash. There is a scenic little slot canyon that develops across the road that leads down to the Green River. The slot can be explored only a short distance before it reaches a large spillover but it is worth at least taking a look at before heading back up to the Island in the Sky. On the trip back up the wash pay careful attention to the cairns t avoid heading up the wrong channel. Looking directly across the canyon from the chute that the Wilhite trail descends is a large alcove. 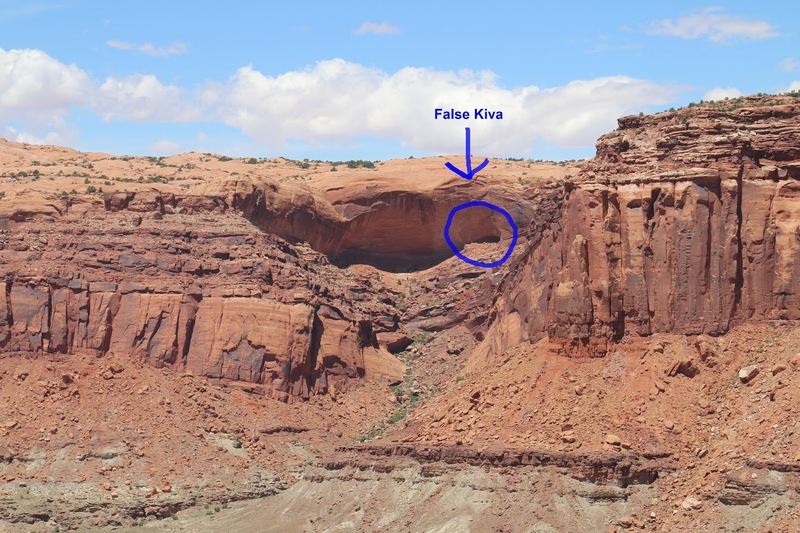 Off to the right is a smaller alcove that houses the False Kiva site. This is a look from the bottom of the chute at the route the Wilhite trail takes to get up and down the Island in the Sky. 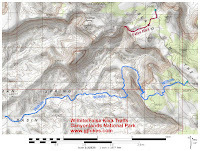 Wilhite is a backcountry trail that requires advanced preparation to complete safely and to have an enjoyable time. Temperatures below the rim can run 20F higher or more than what they are at the trailhead. There isn't any water available at the Visitor Center or on the trail so bring plenty of fluids with you from town. It is recommended to take at least 1 gallon of water per person per day. Rattlesnakes can be encountered at all points along the trail though most hikers will likely never see one. 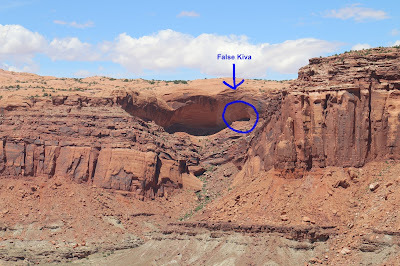 We spoke with 2 backpackers that were startled by one while descending the chute and we saw one while hiking in the wash. The trail through the chute travels over boulders of all sizes and in places it is necessary to use your hands. Loose rocks in the chute and on the hogback can make footing precarious at times. Sturdy footwear and trekking poles can be very useful. Even though there is no cell phone service you may want to take it anyway if it is the only camera that you have. For the very latest information on the Wilhite or any of the other trails in the Island in the Sky District be sure to check with the rangers at the Visitor Center. If you would like to see it for yourself then all you have to do is 'Take a hike'.